Stagecoach are showing good growth in their half yearly figures issued this morning. 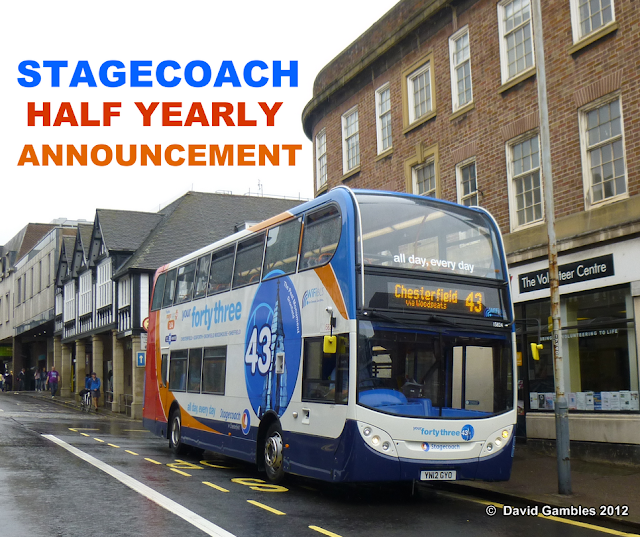 Their press release states "Strong partnerships delivering revenue and profit growth in bus and rail operations"
"Our success is built on strong partnerships across our bus and rail networks. We are delivering a better service for passengers, growing our business sustainably and helping support local communities and the economy. "In the UK, we have achieved further growth in our regional bus operations and we continue to make good progress at our contracted London bus business. Passenger revenue growth remains good on our UK rail networks and we have further developed the alliance with Network Rail at South West Trains. "We are playing an active part in the UK Government's review into rail franchising. The private sector has been central to the huge growth of UK rail travel over the past 15 years and it is important that a sustainable rail franchising programme is restarted as quickly as possible. "Virgin Rail Group has introduced more than 100 new Pendolino train carriages in recent months, boosting capacity on the West Coast mainline. We look forward to it shortly reaching an agreement with the UK Department for Transport for the continued operation of West Coast train services. "In North America, we are pleased with the performance of the businesses acquired in the summer from Coach America. Our budget coach brand, megabus.com, continues to expand to new regions and we now offer low-cost travel to customers in around 120 locations in the United States and Canada. "This summer, many of our employees put in a massive effort to deliver a hugely successful transport operation for the London 2012 Olympic and Paralympic Games. I am proud of their achievement and once again I would like to thank them for their professionalism and dedication. "We see good potential ahead to grow our transport operations in the UK and North America, and we believe the outlook is positive. We are closely focused on the commercial opportunities from our investment in new technology, such as smartcards, digital marketing and social media. These developments are helping customers by making it easier to travel, easier to buy, and easier to get information. Innovation, value for money and strong operational delivery are also key elements of our ongoing programme to drive organic growth and we are making targeted acquisitions where these can add value to the Group."